For the past few years I have been writing about the true origins of Halloween, attempting to demythologize a cultural practice which some in the Church have demonized in extremely gross manners. By doing this, some of our clergy and faithful have only done evil in the name of good, and glorified Satan instead of God, since misplaced demonization is in fact demonic. They may somewhat be excused for being deceived by scholars and extremists who originated such false theories, but in all things the members of the Church should seek the truth with gentleness and honesty, and not stain itself with sensationalism and propaganda that may comfort their fears and soothe their confusion. These critics seem to delusionally think that to demythologize Halloween is the same as to justify it. This only shows stubbornness. The ego often flaws the logical faculty. They think I want children to go trick-or-treating or to carve pumpkins or watch horror movies. They miss the point all together. Of course, I'm not against these things, but neither do I defend them, as I feel they need no defense when the truth sheds its light on these things when they are demythologized. They can choose to swim along the surface of the water without knowing its depth if they choose, but to confuse the shallow area for the deep. A Christian is able to trick-or-treat in the name of the Lord or in the name of Satan if they choose, but the action doesn't mean anything unless they make it to mean something (most just do it in the name of candy). By the same logic, anyone who goes to church on Sunday is a saint just for attending. Of course, they would never admit the latter, but it is the same logic. St. Paul dealt with a similar issue regarding Christians being allowed to eat meat that was sacrificed to idols. His opinion was yes, Christians can eat meat sacrificed to idols, as long as they do it in the name of the Lord and not in the name of a demon. Even Jesus dealt with this among the Jews when He told them that they can have no eternal life unless they ate His body and drank His blood. Everyone turned their back on Jesus when He said this, because they chose to focus on the surface of what He said instead of exploring its depths. 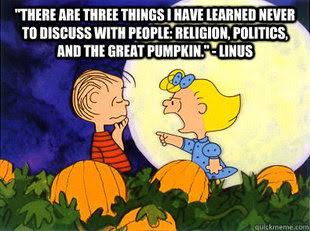 When I started making my thoughts and studies about Halloween public, and I am still only at the beginning stages, I was pretty much the only voice in any Orthodox forum doing so siding with the facts instead of falsehoods. Many who read some or all of my writings on the subject so far, accepted the truth and have graciously thanked me for balancing in their minds and hearts a subject which they thought had to be demonized, because scapegoats that seem to give the appearance of evil are often demonized in this way. Others have accused me of doing the work of the Church of Satan, justifying an evil and pagan practice, and blurring the line between the Church and the world. But is the Church called to demonize or to sanctify the world? Or must the Church demonize the world in order to sanctify it? These are questions I am going to leave open for now, and hopefully revisit in the near future with more detail. But these questions are at the heart of much of the problem, not only regarding Halloween, but it affects the entire mission of the Church in the world. Those who demonize such things as Halloween and the world in general, I am convinced, have never studied the corpus of patristic writings nor the original sources of ecclesiastical history. They show time and time again their ignorance of the Orthodox ethos and phronema. The things they say cannot be found, except in the writings of the heretics, which they also have not studied. How someone can voice their opinions on such sensitive topics without doing the necessary prelimary studies is really beyond me. Well, not really, since I also was once an opinionated fool. I believed that if I read one or two books on a subject that I was an expert, or at least had a right to an opinion. But the truth is, when you set the ego aside, the more one knows about something, the less one really knows. Knowledge of the truth humbles the mind, and does not puff it up. An over-opinionated person is a classic example of someone with puffed up knowledge, usually filled with errors. Humble knowledge goes to the sources, accepts the facts, and dispels with opinions. In my many anti-Halloween emails from disappointed critics, I often feel like I am hearing the rants of 8th century Iconoclasts. The Iconoclasts basically believed that the images of Christ, the Theotokos and the Saints were idols. After all, the Bible did say to not make or worship any graven images. Images, they believed, originated with the pagans. Pagans would worship these images of deified gods, and even sacrifice children before them. How could the Church take something with such an evil history, before which evil things were done and saints toppled with their prayers, and which demons used to communicate with people, and depict holy things in a similar manner, bow down before them, offer incense to them, and kiss them? They said similar things about the relics of saints. Many Orthodox believed these sensationalistic lies because of their immature knowledge of the Faith and began a persecution against icons, the relics of saints and those who honored them. They would call those who supported icons and relics Pagans, and sometimes they would go to such extremes and torture and kill the Iconophiles. Iconoclasts were nothing more than people with puffed up opinions of what the Bible and a few Church Fathers seemed to have said about images, as was revealed by their contemporary Orthodox apologists who understood that "the letter of the law kills, while the spirit quickens". "For I look upon it as a great calamity that the Church, adorned with Her great privileges and the holiest examples of saints in the past, should go back to the first rudiments, and fear where there is no fear. It is disastrous to suppose that the Church does not know God as He is, that She degenerates into idolatry, for if She declines from perfection in a single iota, it is as an enduring mark on a comely face, destroying by its unsightliness the beauty of the whole." Here he basically says that the saints of the past, in Old Testament times, feared to make graven images because of its pagan associations. But now that God has taken to Himself material creation, there is no longer any fear. The Iconoclasts believed the Church was degenerating into idolatry, when in fact they do not know God as He truly is - fully God AND fully man. "Now, the devil, the enemy of the truth and of man's salvation, in suggesting that images of corruptible man, and of birds and beasts and reptiles, should be made and worshipped as gods, has often led astray not only heathens but the children of Israel. In these days he is eager to trouble the peace of Christ's Church through false and lying tongues, using divine words in favor of what is evil, and striving to disguise his wicked intent, and drawing the unstable away from true and patristic custom." I can go on and on, but I think I made my point. When it comes to the subject of Halloween, things get even worse from a logical point of view. At least the Iconoclasts were correct that graven images had their source among the pagans. Even St. John admits this, and says that it took Christ taking on human flesh to sanctify material creation and allow for images to be made in the name of the Lord. But modern Halloween has no pagan roots, as the clear evidence suggests. That Halloween has become associated with paganism and satanism is an invention of Christians primarily to demonize not only a folk tradition, but something that has its source in the Church of the Middle Ages before the Reformation. But I have written much on this subject and don't feel like I need to address this any further here. The iconoclastic persecution lasted over a hundred years, and much bloodshed was spilled in the process. Why? Because certain Orthodox Christians who thought they knew theology and the tradition of the Church in fact were living in a delusional state with their childish theology that satisfied their own ego. That is a simple but true way of putting it. Nothing is new under the sun. People in the Church, which includes many of our clergy, monastics and theologians, have always been like this from the beginnings of Christianity and will be like this until the end of time. This is why a sober education is needed now, just as it always has been needed, not only for minor subjects like Halloween, but for everything in which a scrap of falsehood can be found. The Church was established, according to the apostolic fathers, to rid the world of superstition and falsehood in order to sanctify it. This is the primary mission of the Church in the world.